Almost 25 years after its opening, the Tennessee Theatre hosted the most high-profile event of its career. 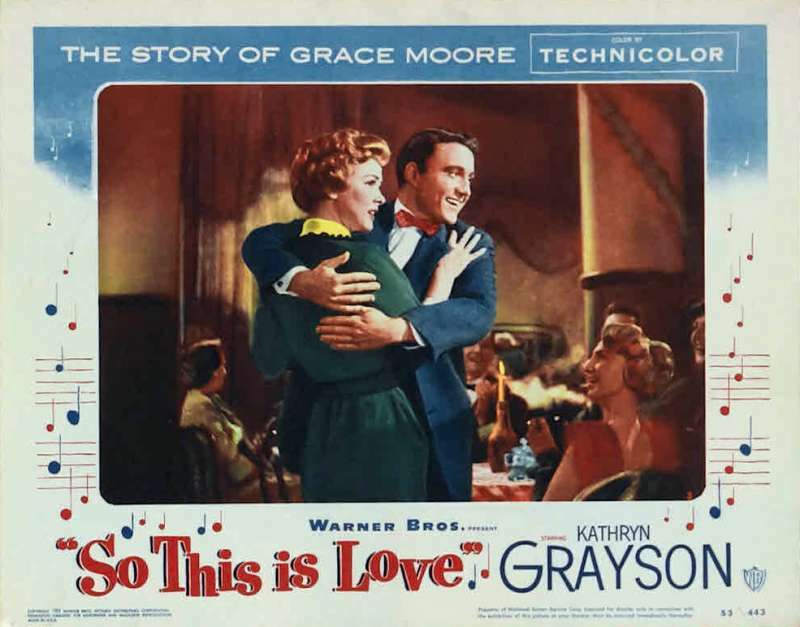 So This Is Love, an homage to East Tennessee native Grace Moore, premiered at the Tennessee on July 29, 1953. As one of Hollywood’s first musical stars, Grace’s sudden death in 1947 demanded a biopic of her life. Warner Brothers agreed to a light musical version to shed light on Moore’s short but successful life and career. Born Mary Willie Grace Moore in Cocke County, Tennessee, she and her family relocated to Knoxville when she was two years old. Several years later they moved to Jellico, Tennessee, where Grace spent her adolescence, and once high school ended, Moore had a brief stent at Ward-Belmont College in Nashville before moving to New York City to expedite her musical career. Her first Broadway appearance was in Hitchy-Koo, written by Jerome Kern. Shortly after, she began training for a career in opera, and her operatic debut was for the Metropolitan Opera in New York City on February 7, 1928. In the 1930s and 40s, Moore headlined concert performances throughout the United States and Europe in which she performed a variety of operatic selections in various languages, including English, Spanish, German, French, and Italian. In Hollywood, under contract to Columbia Pictures, Moore made six films, most notable being One Night of Love. She portrayed a small-town girl who aspires to sing opera, a familiar story to the girl who grew up in rural Tennessee with a dream of the stage. For her role in this movie, she was nominated for the Academy Award for Best Actress in 1935. Moore’s legacy was quickly sky-rocketing, but unfortunately, right at its peak, she was killed in a plane crash while she’d been traveling in Europe with a few others, including Prince Gustaf Adolph of Sweden. A documentary of her life was in high demand, and Warner Brothers obliged with So This Is Love, starring Kathryn Grayson. Moore’s surviving family was located in Knoxville, Jellico, and Chattanooga, and each destination was contending to host the premiere of the life of East Tennessee’s diva. Knoxville won out, and although the movie had been released two weeks earlier than the local premiere, there still wasn’t a review in The New York Times. It was the biggest film gala held in Knoxville with four recognizable film stars in tow: Grayson, Merv Griffin, Walter Abel, and Joan Weldon. There were three days full of formal dinners, country-club balls, an auction fundraiser, and dedications. Overall, the movie received positive reviews as it was whimsical retelling of the Grace Moore story, and the city’s first ever world premiere put Knoxville on the map during the height of the Hollywood era. Stay informed about the musical groups and cultural performers coming to the Tennessee Theatre.